After our session with The Writers’ Bloc (and after the intense political discussion about politics at Serenitea, Scout Rallos), my friend Mars and I went to My Kitchen by Chef Chris Locher at Oasis Paco Park Hotel, Manila. She’d been boasting about this food, which she tasted years back in Pampanga. As a birthday gift to me, she used the voucher she bought from Metrodeal so we could buy the specialty of the restaurant – Panizza! Oasis Paco Park Hotel was rather an old boutique hotel. My Kitchen was located beside the pool at the ground floor. It’s a cozy restaurant serving quite pricey European dishes, but were truly worth the price because of the size of the servings and of course, the taste! 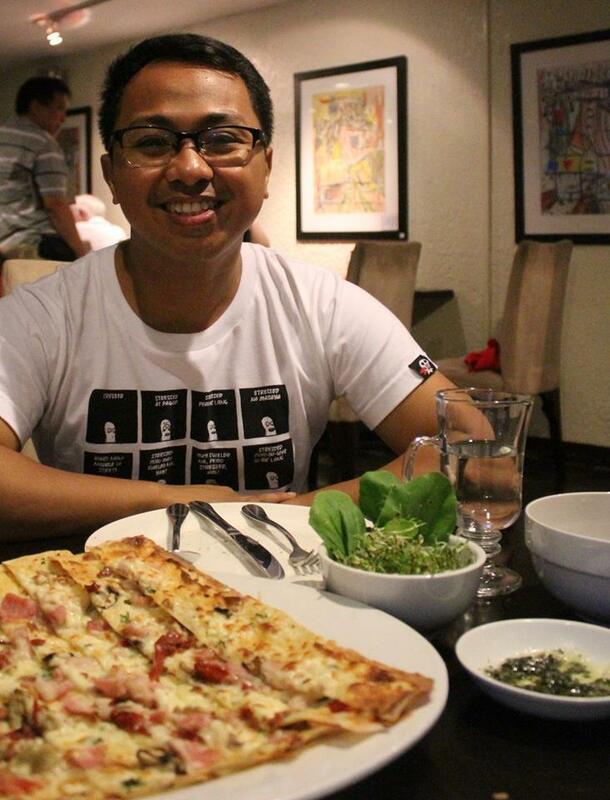 And what’s making the buzz is the restaurant's Panizza, which is Chef Chris Locher’s own creation! 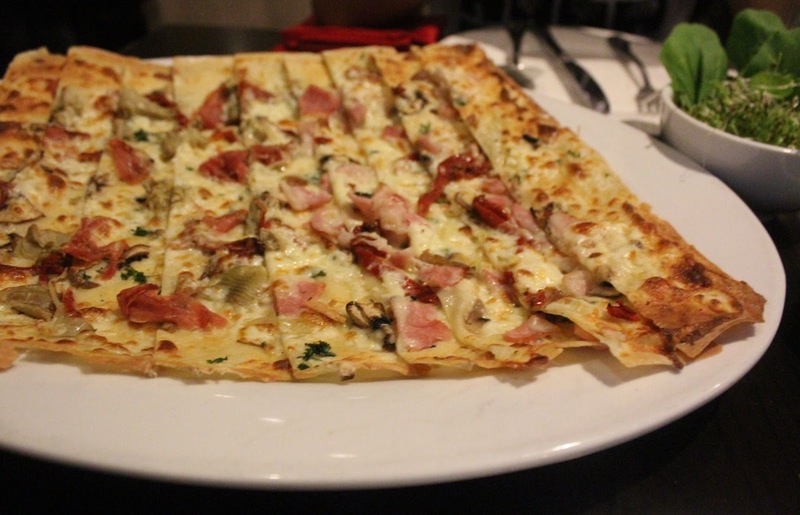 It’s a crispy, thin dough layered with cheese and topped with shrimp, grouper dices and capers. It will be served with a bowl of arugula and alfalfa sprouts. 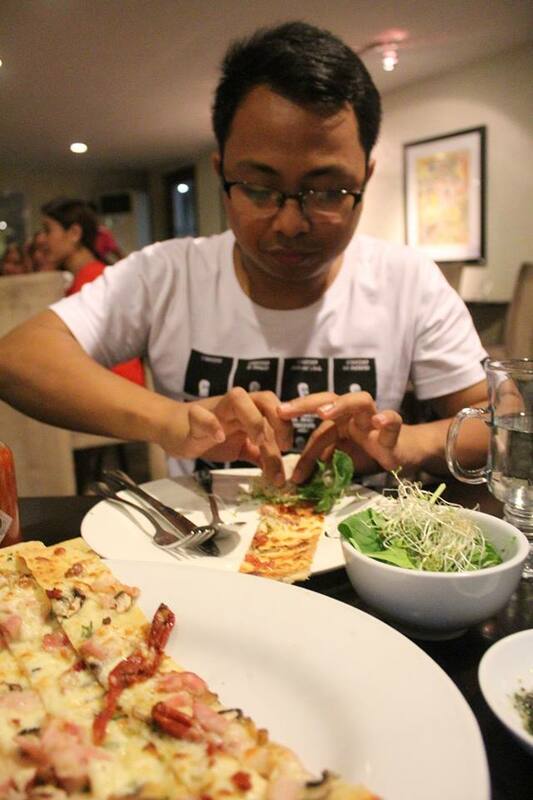 The best experience is the process of putting on the arugula and alfalfa sprouts, and then rolling each slice afterwards, and then biting the panizza as you feel (and hear) the crispiness of the food! Truly a flavorful experience! For more information about My Kitchen by Chef Chris Locher, visit: http://www.oasispark.com/dine-drink/my-kitchen-by-chef-chris.htm.